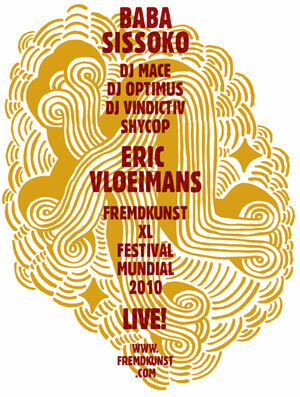 We’re very proud to announce that Fremdkunst will be playing live @ Festival Mundial 2010 together with the superb percussionist Baba Sissoko and master on the trumpet Eric Vloeimans. More info about Fremdkunst: www.fremdkunst.com. Fremdkunst silkscreen prints by Mister Adam will be for sale on this day. If you’re lucky, you will also be able to buy brand new Fremdtunes T-shirts!